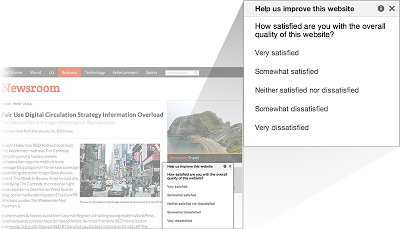 Website satisfaction surveys allow you to easily create customer satisfaction surveys in order to stay in tune with what your customers think. All you have to do is paste a small snippet of code in the HTML for your website. This will load a discreet satisfaction survey in the lower right hand corner of your website so you can get immediate feedback from your users. Users will be asked to complete a four-question satisfaction survey. Surveys will run until they have received 500 responses and will start again after 30 days so you can track responses over time. This is currently limited to US English visitors on non-mobile devices. The default questions are free and you can customize questions for just $0.01 per response or $5.00 for 500 responses. 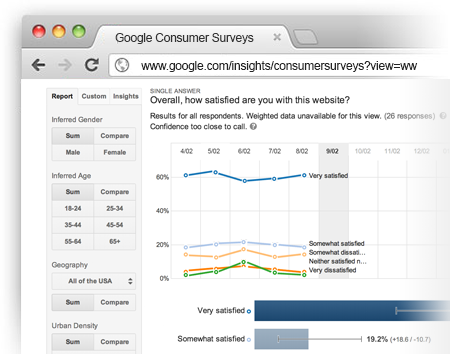 By using Google Consumer Surveys to measure website satisfaction you automatically get aggregated and analyzed responses, provided to you through a simple online interface. Creating a website satisfaction survey is simple. Give it a try now! If you are like most business owners, you know how important a healthy online community is to your business’s success. Traditionally, collecting user feedback has been an expensive and time-consuming process, but now you can hear from your site visitors for free using Google Consumer Surveys.